Why aren’t my AddThis tools showing up? AddThis tools are designed to be as simple to use as possible. After an initial setup, changes can be implemented through the AddThis dashboard, without touching the code on your site. However, there are a few things that can go wrong. Don’t worry – we’re here to help you troubleshoot! When you install your AddThis code for the first time, or make changes to your existing tools, the settings should be reflected on your site almost immediately. If that’s not the case, try refreshing the page or waiting just a few minutes for the changes to be pushed to our servers around the world. Still nothing? Try clearing your website cache. Some AddThis customers use caching services like Cloudflare that can cause a delay in changes appearing on your website. Clearing the cache and refreshing the page will pull a new version of the page with the changes reflected. Some ad blockers and other browser extensions prevent our tools from loading on a page. To test if this is the case for your site, try visiting your website in a private window, or on a browser without any extensions installed. If the tools load properly in that window, then it’s an issue specific to your browser. Disabling your ad blocker for your specific website will allow your AddThis tools to appear. If you’ve recently enabled a Related Posts tool and it is not appearing, that issue is most often resolved with time. In order to make the best content recommendations to your visitors, our Related Posts algorithm must observe at least 500 visits/month to your site and can take up to 24-48 hours from the time you activate the tool to do so. You can learn more about how our Related Posts algorithm works in this article. For inline tools, there is an additional snippet of code that you will need to place in the body of your webpage where you would like the tool to appear. If you have an inline tool activated, this snippet of code will appear under step 2 of the install instructions on your “Get the Code” page. If you think you have the AddThis code installed correctly but aren’t sure, first, right click anywhere on the page and select “Show Page Source.” Then, search for ‘addthis’ to help you find the AddThis snippet. Confirm that the AddThis code is appearing and matches the “Get the Code” page exactly. All AddThis tools are disabled by default. After setting up your account, go to the Tool Gallery to enable the tools that you would like to appear on your site. AddThis makes changes to all pages using a particular profile id. To do this, use the instructions on this page. 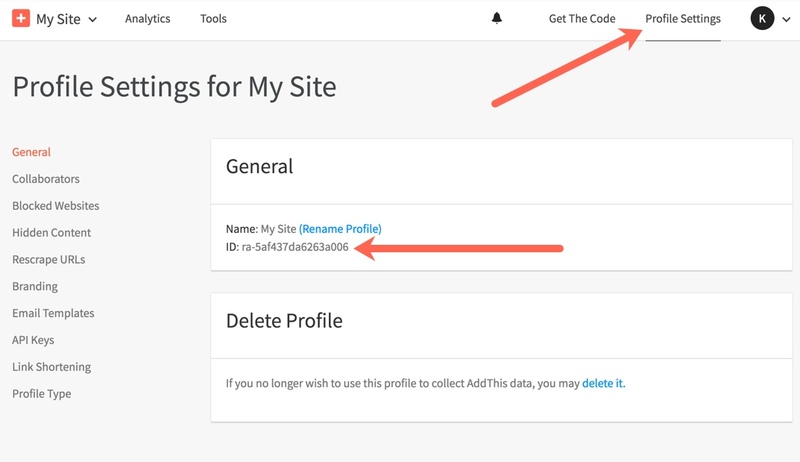 Then go to “Profile Settings” in your AddThis dashboard and verify that the profile IDs match. Tried all of that? Let us help! Send us a message and a member of our team can help troubleshoot the issue for you. Why are my tools appearing but my analytics data is not? There is a slight delay in data appearing in your AddThis analytics. All of the analytics views have a 24-hour delay, except for our last 72-hour view which has a delay of just a few hours. If you’ve recently installed AddThis and your tools are appearing correctly, you should see data coming into that view a few hours after installing, and you should see data in the other views around 24 hours after installing. Why are the wrong share counts appearing? Most often, an issue with the share counts is actually a misunderstanding of how these share counts are measured. Check out this article to fully understand AddThis share counts. Still think your share counts are incorrect? Check out our article explaining the possible reasons here. Why is the wrong information showing in the page preview? 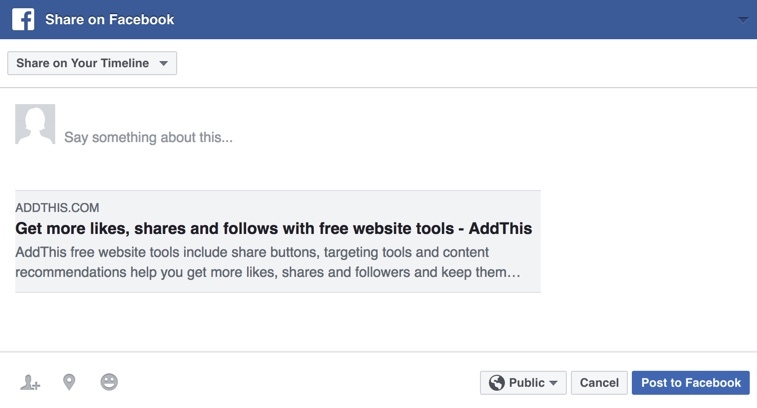 Social platforms like Facebook use Open Graph meta tags to determine what content to display in sharing dialogs. We suggest adding the following Open Graph tags to each of your pages: og:image, og:description, og:title, and og:url. Check out our Open Graph documentation for more instructions on how to do that. If you’ve already added Open Graph tags, we suggest looking at the Facebook Debugger see if Facebook is reporting any errors. Have an issue that you don’t see here? We’re happy to help troubleshoot any issues you are having. You can ask us a question and our rockstar support team will respond to you as soon as they can.